As a Juneau resident since 1974 and married to a life-long Juneau resident, I am pleased to introduce you to this Shangrila of the North – Juneau, Alaska. 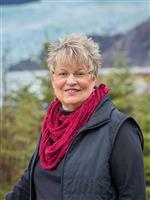 Since 1989 I have helped numerous families buy and sell homes in the Juneau area. The only thing that exceeds my experience, local area expertise and knowledge of the communities is my commitment to you, with my Number 1 goal being your satisfaction. Voted "2005 Realtor of the Year"
I enjoy keeping in step with today's fast-paced technology, and leveraging it to give the best and most complete service to my clients. "Autograph your work with Excellence" is Powell Realty's Corporate Mission. My personal mission is to provide the best professional service to my clients, honor God in all I do, and make a positive difference in people's lives.